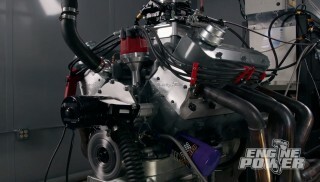 Pat and Mike button up their Gen III Hemi with super trick heads, then it's tech tip time with Mike and Pat. Premium spray-on thermal insulation product for all cars, trucks, street rods, customs or race cars ---wherever heat is a problem. Rebuilt and remanufactured differentials and rear ends. 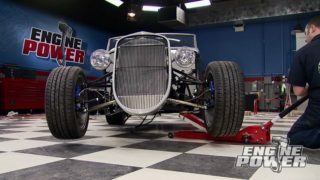 (MIKE)>> WELCOME TO AN AWESOME EPISODE OF ENGINE POWER. TODAY WE HAVE A LINE UP THAT WILL SATISFY ANY GEARHEAD. INCH HEMI THAT WE DUBBED "PROJECT STRAY CAT". 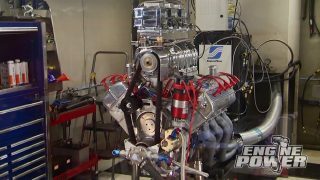 NOW THIS ENGINE IS RECEIVING TWIN TURBOS AND IT'S GOING BETWEEN THE FRAME RAILS OF THE POWERSTOP ULTIMATE CHALLENGER SWEEPSTAKES GIVEAWAY THAT MARK AND TOMMY ARE ASSEMBLING DOWN IN DETROIT MUSCLE. NOW THEY WANT TO SEE AROUND 800 HORSEPOWER AT THE TIRES, AND THIS IS THE FOUNDATION THAT'LL GET THEM THERE. NEW MELLING OIL PUMP. MOPAR PERFORMANCE LIFTERS WENT IN WITH NEW RETAINERS, AND THE FRONT TIMING COVER WENT ON. UNDERNEATH WE DROPPED ON THE WINDAGE TRAY/PAN GASKET COMBO, THE OIL PUMP PICKUP, AND SEALED THE BOTTOM UP WITH THE FACTORY PAN. (PAT)>> NOW LET'S TALK INDUCTION, STARTING WITH THE CYLINDER HEADS. PLUS THEY WERE METICULOUSLY HAND FINISHED. THE WAY UP TO 120 THOUSANDTHS TO ACCOMMODATE ANY COMBO. NOW WHEN WE COME BACK THESE GASKETS AND THESE CYLINDER HEADS ARE GETTING PUT ON THAT SHORT BLOCK. 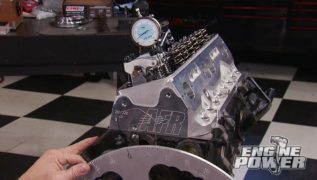 (PAT)>> WE'RE CONTINUING ON WITH OUR 426 INCH STROKER GEN THREE HEMI, AND WE'RE GONNA DRESS IT OUT TO LONG BLOCK FORM BEFORE IT GOES DOWN TO MARK, AND TOMMY, AND DETROIT MUSCLE. BUT FOR RIGHT NOW IT'S TIME FOR SOME HEAD GASKETS. REMEMBER OUR PISTONS WERE 10 THOUSANDTHS ABOVE THE DECK SURFACE. SO WE'RE USING A 40 THOUSANDTHS COMPRESSED THICKNESS COMETIC MLS TO SEAL THIS ONE UP, MAKING OUR CALCULATED COMPRESSION RATIO 10.4 TO ONE. OUR REWORKED HEADS CAN NOW BE POSITIONED ON THE DOWELS, AND ARP HEAD STUDS CAN BE SCREWED INTO PLACE. THE GEN THREE HEMI HAS A SPECIFIC HEAD FOR THE DRIVER AND PASSENGER SIDE. MAKE SURE YOU MARK THEM WHEN IT'S COMING APART AND GET THE CORRECT ONE BACK IN ITS RESPECTIVE PLACE, OR IT WILL JUST COST YOU TIME LATER ON. ARP ULTRA TORQUE IS PLACED ON TOPS OF THE WASHERS AND THREADS. FINALLY THE NUTS CAN BE RAN DOWN AND TORQUED TO 105 POUND FEET. (MIKE)>> SAME PROCESS FOR THE PASSENGER SIDE, AND WE MARKED IT AS WELL. NOW IT'S TIME TO SEE IF THE FACTORY PUSH RODS WILL WORK. NOW JUST BECAUSE YOU'VE GOT A NEW AFTERMARKET CAM SHAFT DOESN'T NECESSARILY MEAN YOU NEED NEW PUSH RODS. NOW WITH THAT BEING SAID, LIFT AND DURATION BOTH DIRECTLY EFFECT THE PUSH ROD LENGTH. NOW HERE'S SOMETHING ELSE. DON'T JUST LISTEN TO WHAT SOMEBODY ELSE HAS TO SAY ABOUT THE LENGTH OF PUSH ROD YOU NEED FOR YOUR ENGINE. 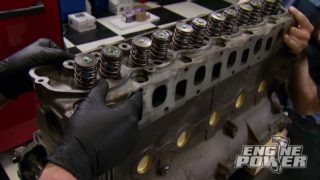 THERE ARE SEVERAL OTHER FACTORS INVOLVED, LIKE HOW MUCH THE BLOCK AND THE HEADS HAVE BEEN MILLED, THE THICKNESS OF THE HEAD GASKET, AS WELL AS THE LENGTH OF AFTERMARKET VALVES. THEY ALL DIRECTLY EFFECT THE LENGTH. WE'LL ROLL THE ENGINE TO WORK ON THE NUMBER ONE CYLINDER. NOW DROP IN OUR MATCO EXTENDED TDC INDICATOR, AND ROTATE THE ENGINE SO THE NUMBER ONE CYLINDER IS AT TDC ON THE COMPRESSIONS STROKE. DROP IN OUR ADJUSTABLE PUSH RODS WITH THEM AS SHORT AS POSSIBLE. NOW LAY THE ROCKER SHAFT ASSEMBLIES IN PLACE AND TIGHTEN THEM UP, MAKING SURE THE PUSH ROD DOES NOT CONTACT THE ROCKER. EXTEND THE PUSH RODS UNTIL THEY MAKE CONTACT WITH THE ROCKER. THIS IS CALLED ZERO LASH. SINCE THIS IS A NONADJUSTABLE ROCKER WE CAN NOW REMOVE THE ASSEMBLY. PULL BOTH PUSH RODS AND WE'LL TAKE THEIR MEASUREMENTS USING A LARGE 12 INCH DIGITAL CALIPER. WE HAVE SIXFIVE-50 ON THE INTAKE, SEVENSEVEN-80 ON THE EXHAUST. NOW WE NEED TO ADD 50 THOUSANDTHS FOR LIFTER PRELOAD. OUR FINAL IS SIX-600 ON THE INTAKE, SEVENEIGHT-30 ON THE EXHAUST. SO THOSE ARE THE TWO WE'LL ORDER. ANTISEIZE CAN GO ON THE CRANK SNOUT AND ON THE INSIDE OF THIS ATI BALANCER WE GOT FROM SUMMIT RACING. SINCE THE EAGLE CRANK IS KEYED, A NEW BALANCER WAS IN THE PARTS LIST. IT'S TORQUED TO 140 POUND FEET. 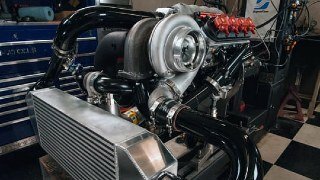 A NEW WATER PUMP IS A MUST IN ENGINE BUILDS LIKE THIS. WE DON'T WANT TO TAKE ANY CHANCES WHEN HANDING IT OFF TO MARC AND TOMMY. ARP FASTENERS FROM THE ACCESSORY KIT HOLD IT ON. (PAT)>> TO GIVE THE ENGINE A DIFFERENT APPEARANCE WE COVERED THE INTAKE MANIFOLD IN VHT'S HIGH TEMPERATURE WRINKLE PLUS TEXTURED COATING. IT'S GOOD TO 350 DEGREES. NEW COMETIC GASKETS WILL MAKE THE SEAL FROM IT TO THE CYLINDER HEADS, AND MORE ARP FASTENERS WILL CINCH IT DOWN. (MIKE)>> WE'RE PUTTING THE FACTORY INJECTORS BACK IN FOR NOW. MARC AND TOMMY WILL CHANGE THEM WHEN THEY INSTALL THE HELLION TURBO SYSTEM IN THEIR SHOP. WE'RE JUST PLUGGING THE HOLES. A NEW THERMOSTAT GOES IN NOW. IT'S THE FACTORY 203 DEGREE UNIT. THE SENSORS ARE NEXT, STARTING WITH THE CAM SENSOR. NOW THE CRANK, KNOCK SENSORS, OIL TEMPERATURE, AND OIL PRESSURE. NOW THE WATER TEMPERATURE. THE FACTORY THROTTLE BODY GOES BACK ON, ALONG WITH THE BELT TENSIONER AND THE IDLER PULLEY. 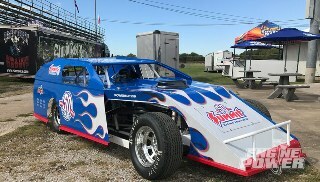 (PAT)>> TRENT PERFORMANCE HAS BEEN OUR PUSH ROD SOURCE FOR THE LAST COUPLE OF ENGINES WE'VE BUILT. THEY ARE HANDS DOWN ONE OF THE LEADERS IN INNOVATION WHEN IT COMES TO PUSH RODS, WRIST PINS, AND VALVETRAIN TESTING NAD EVALUATION. THESE HAVE A FIVESIXTEENTHS INCH DIAMETER AND A 105 WALL THICKNESS. THE BALL ENDS ARE FACTORY OEM HEMI SIZED AT FIVESIXTEENTHS. THE ROCKERS ARE OILED THROUGH THESE SMALL HOLES IN THE STANDS THAT ARE DRILLED INTO THE HEADS. THE INTAKE SHAFT ASSEMBLIES CAN GO ON NOW AND TORQUED TO 25 POUND FEET, FOLLOWED BY THE EXHAUST SHAFTS THAT ARE TORQUED TO THE SAME SPEC. (MIKE)>> THESE ARE THE REAL REASON WE PAINTED THE INTAKE MANIFOLD. WE WANTED THESE BILLET VALVE COVERS TO CATCH YOUR EYES AS MUCH AS POSSIBLE WHEN YOU SAW THEM. THIS WAS A REALLY FUN BUILD, AND PAT AND I ARE SUPER EXCITED TO BE A PART OF IT FOR A COUPLE OF DIFFERENT REASONS. 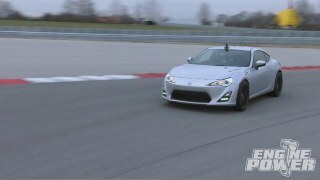 THE FRIST ONE IS IT'S GETTING TWIN TURBOS AND IT'S GONNA MAKE SOME REALLY BIG POWER AT THE TIRES. SECOND, ONE OF YOU LUCKY VIEWERS ARE GONNA HAVE A CHANCE TO WIN THE ENTIRE PROJECT ONCE THE POWERSTOP ULTIMATE CHALLENGER SWEEPSTAKES OPENS UP. SO MAKE SURE YOU KEEP YOUR EYES PEELED. (ANNOUNCER)>> LIKE THEY SAY, TIMING IS EVERYTHING. COMING UP HOW TO MAXIMIZE IT. ON SOME HOW TO TECH ON THE ENGINE'S NERVE CENTER. SO PAY ATTENTION. 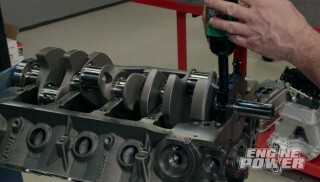 THE TIMING HELPS MAXIMIZE AN ENGINE'S OUTPUT. NOW THE DISTRIBUTOR IS WHAT DICTATES WHEN THE ENERGY FIRES THE SPARK PLUG. SO TODAY WE'RE GONNA SHOW YOU HOW TO LOCK ONE OUT. MOST DISTRIBUTORS YOU DEAL WITH HAVE A TIMING CURVE IN THEM. THAT MEANS WHEN THE ENGINE IS IDLING THE TIMING IS SET AT ITS MINIMUM POSITION. AS THE RPM'S ARE INCREASED, WEIGHTS AND SPRINGS IN THE DISTRIBUTOR MOVE THE POSITION OF THE ROTOR TO ADVANCE TIMING, SOMETIMES AS MUCH AS 24 DEGREES. MUCH YOURS HAS IN IT. THE VACUUM ADVANCE ON A DISTRIBUTOR IS THERE FOR THE SOLE PURPOSE OF EMISSIONS AND DRIVABILITY, PULLING ADDITIONAL IGNITION TIMING IN AT LIGHT LOAD AND PARTIAL THROTTLE SITUATIONS LIKE NORMAL EVERYDAY DRIVING. THAT'S WHY IT'S IMPORTANT TO HAVE IT HOOKED UP TO A MANIFOLD VACUUM SOURCE INSTEAD OF A CONSTANT VACUUM SOURCE. WE LIKE TO HAVE TOTAL CONTROL OVER THE TIMING IN THE ENGINES WE BUILD. MOST ARE HIGH PERFORMANCE BULLETS THAT ARE BUILT FOR SPECIFIC PURPOSE. MSD DISTRIBUTORS HAVE A PROVISION IN THEM TO LOCK THE DISTRIBUTOR OUT IF YOU WANT, AND MOST RACERS WILL WANT TO CONTROL THEIR IGNITION CURVE ELECTRONICALLY WITH A BOX LIKE AN MSD DIGITAL SEVEN. THEY DON'T WANT TO RELY ON SPRINGS OR WEIGHTS TO SET THEIR TIMING CURVE. THE FIRST THING WE NEED TO DO IS REMOVE THE ROTOR. THIS GIVES US ACCESS TO THE SPRINGS AND WEIGHTS. AS RPM INCREASE, THE WEIGHTS ARE FORCED AWAY FROM THE CENTER, WHICH MOVES THE ROTOR ADVANCING ITS POSITION. THIS IS WHAT WE'LL REMOVE TO LOCK OUT THE CENTRIFUGAL ADVANCE. THE SPRINGS NEED TO BE REMOVED, WHICH IS EASY. JUST PRY THEM OFF THE POST. NOW THE WEIGHTS CAN BE REMOVED AND THE ROLL PIN SECURING THE BUSHING CAN BE TAPPED OUT AND REMOVED, ALONG WITH THE BUSHING. BACK ON TOP I'LL SEPARATE THE ROTOR SHAFT FROM THE MAIN SHAFT AND REMOVE THE NUT AND WASHER ALONG WITH THE ADVANCE BUSHING. ROTATE THE ROTOR SHAFT 180 DEGREES AND ALIGN IT WITH THE HOLE ON THE OPPOSITE SIDE, SECURE IT DOWN. REPLACE THE BUSHING AND TAP THE ROLL PIN BACK INTO PLACE. WITH ALL OF OUR UNUSED PARTS LEFT ON THE TABLE, THE ROTOR CAN GO BACK ON. 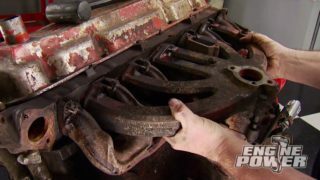 NOW THERE'S NOTHING LEFT IN THE DISTRIBUTOR THAT WILL CAUSE A TIMING VARIANCE AT ANY RPM, AND THAT'S HOW YOU LOCK OUT A DISTRIBUTOR. (ANNOUNCER)>> NOW YOU KNOW HOW TO MODIFY ONE. HERE'S AN EASY WAY TO INSTALL IT. (MIKE)>> INSTALLING A DISTRIBUTOR IS A POPULAR TOPIC IN OUR EMAIL BAG, AND MOST OF THEM ARE ASKING, HOW DO WE GET SO LUCKY DROPPING IN A DISTRIBUTOR AND GETTING AN IMMEDIATE FIRE UP EVERY TIME? (PAT)>> WELL THERE'S NO LUCK INVOLVED. IT'S A SIMPLE UNDERSTANDING OF POSITIONING AND THE PROCESS WE'RE GONNA SHOW YOU HERE APPLIES TO ALL ENGINES THAT HAVE DISTRIBUTORS. 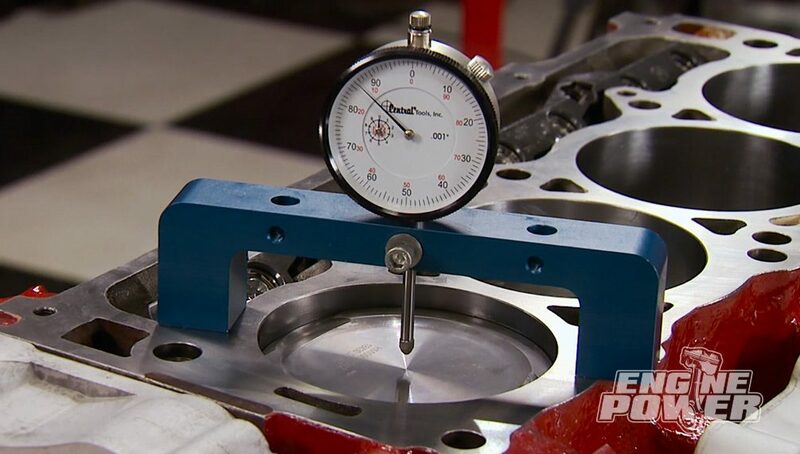 (MIKE)>> THE FIRST THING TO DO IS MAKE SURE THE NUMBER ONE CYLINDER IS COMING UP ON TOP DEAD CENTER ON THE COMPRESSION STROKE. THERE'S A COUPLE OF WAYS TO DO THAT. THE FIRST, AND GENERALLY EASIEST, IS TO HAVE THE NUMBER ONE CYLINDER SPARK PLUG REMOVED. NOW PLACE YOUR FINGER OVER THE HOLE AND TURN THE ENGINE OVER SLOWLY. WHEN THE PISTON COMES UP ON THE COMPRESSION STROKE IT WILL FORCE AIR OUT OF THE CYLINDER AND PUSH YOUR FINGER OFF ITS SEAL LIKE THIS. 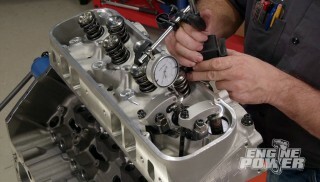 (PAT)>> THE SECOND WAY IS MORE INVOLVED AND REQUIRES YOU TO PULL A VALVE COVER. WHEN YOU'VE TURNED THE ENGINE OVER AND BOTH VALVES ARE CLOSED AND THE ROCKER'S NOT MOVING, YOU'RE COMING UP ON THE COMPRESSION STROKE. NOW SLOWLY TURN THE CRANK TO GET THE TIMING MARK, OR ZERO DEPENDING ON YOUR BALANCER, ABOUT 30 DEGREES BEFORE ON THE TIMING POINTER. TO PUT IT IN SIMPLE TERMS, THERE ARE 360 DEGREES IN A CIRCLE. SO THAT MEANS 30 DEGREES IS A LITTLE LESS THAN ONETENTH OF THAT, WHICH IS A VERY SMALL DISTANCE. NOW IT'S TIME TO DROP THE DISTRIBUTOR IN. THE IMPORTANT THING IS TO POSITION THE ROTOR WHERE YOU WANT IT, NOT WHERE IT FALLS. THIS IS IMPORTANT FOR YOUR WIRE ROUTING TO LOOK NEAT AND CLEAN. TO MAKE IT DROP ALL THE WAY DOWN ALL YOU HAVE TO DO IS ROTATE THE ENGINE AND THE DISTRIBUTOR WILL INDEX THE OIL PUMP DRIVE. SEE FLAMES COME OUT OF YOUR CARBURETOR AGAIN. PLUS IT'LL JUST MAKE YOUR LIFE SIMPLER. (PAT)>> ONE MORE THING ABOUT DISTRIBUTORS, YOU CAN'T RUN AN IRON GEAR ON A STEEL CAM. IN THIS CASE THE MATERIALS HATE EACH OTHER AND YOU'LL GET ALMOST IMMEDIATE FAILURE ON YOUR DISTRIBUTOR GEAR. A COMPOSITE, OR BRONZE, GEAR LIKE THIS ONE FROM MSD WILL SOLVE THE PROBLEM. THE BRONZE MATERIAL IS SOFTER THAN THE CAM SHAFT GEAR, ALLOWING FOR A FRIENDLY MESH BETWEEN THE TWO. 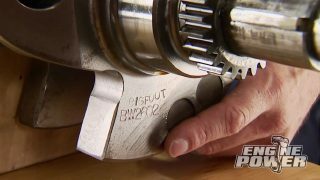 THE GEAR ISN'T HARD TO CHANGE, BUT ITS POSITION ON THE DISTRIBUTOR SHAFT IS CRUCIAL. LUCKILY MSD PROVIDES THE CORRECT DIMENSIONS FOR ITS PLACEMENT ON THIS SHEET. SIMPLY REMOVE THE PIN AND PRESS IT OFF AND THE NEW ONE ON. MAKING SURE IT'S AT FACTORY SPEC, DRILL A NEW HOLE FOR THE NEW PIN AND YOU'RE GOOD TO GO FOR THE LONG HAUL. A GREAT WAY TO COMBAT THAT INTERIOR HEAT IN YOUR RACE CAR OR STREET BEAST IS WITH LIZARD SKIN'S CERAMIC INSULATION. COATING THE ENTIRE INTERIOR WILL REDUCE YOUR TEMPS INSIDE YOUR RIDE BY UP TO 30 DEGREES OR MORE, AND APPLICATION IS MADE EASY BY UTILIZING THEIR AVAILABLE SUPER PRO APPLICATION KIT. COVERING IT WITH THEIR TOP COAT AFTERWARDS WILL GIVE A DURABLE, ABRASION RESISTANT GLOSSY FINISH THAT WILL IMPROVE ITS PERFORMANCE EVEN MORE, AND YOU CAN CHECK OUT THE ENTIRE PRODUCT LINE AT LIZARD SKIN DOT COM. 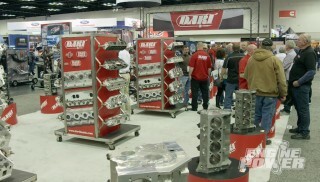 (MIKE)>> POWERTRAIN PRODUCTS INC., OFFERS FRONT AND REAR DIFFERENTIALS FOR ALL DOMESTIC AND MOST FOREIGN APPLICATIONS. TRANSMISSIONS, TRANSFER CASES, AND DIFFERENTIALS USED OR REMANUFACTURED, AND THEY ALL CARRY A NEW, IMPROVED NO FAULT WARRANTY. NOW TO FIND OUT MORE INFORMATION ON THE PARTS YOU NEED AND THE WARRANTY IT CARRIES, VISIT THEIR WEBSITE AT SHOP ENGINES DOT COM. BY LOGGING ON TO ROCK AUTO DOT COM. 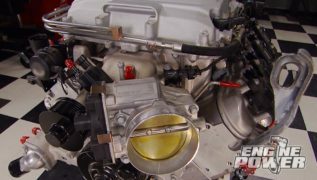 TODAY'S TECH TIP IS GONNA SEAL THE DEAL ON ANY ENGINE THAT YOU BUILD FROM MILD TO WILD. WE'RE TALKING PISTON RINGS. NOW THEY'RE PROBABLY THE LEAST GLAMOUROUS OF ALL ENGINE PARTS BUT ARGUABLY ONE OF THE MOST IMPORTANT. THEY'RE UNIQUE THE FACT THAT THEY'RE A MOVING SEAL UNDER EXTREME PRESSURES AND TEMPERATURES, BUT THEIR JOB DESCRIPTION IS SIMPLE, TO SEAL UP CYLINDER PRESSURE. DEPENDING ON THE RING'S APPLICATION, THEY'LL VARY IN DESIGN AND MATERIAL. LET'S START WITH MATERIAL. AT ITS BASIC LEVEL, THE TOP AND SECOND RINGS ARE CONSTRUCTED OF CAST IRON. THEY'RE EASY TO MACHINE AND CHEAP TO PRODUCE, AND THEY'RE USED IN APPLICATIONS FOR VERY SIMPLE ENGINES, LIKE AIR COOLED LAWN MOWERS, FARM TRACTORS, AND EVEN AUTOMOTIVE APPLICATIONS FROM THE 1970'S AND OLDER. THE OIL CONTROL RING THAT TYPICALLY GOES WITH THOSE ARE A THREE PIECE DESIGN THAT SCRAPES EXCESSIVE OIL OFF THE CYLINDER. THEY CONTAIN AN EXPANDER WITH TWO OUTER RAILS, AND THEY'RE TYPICALLY CONSTRUCTED OF INEXPENSIVE STEEL. IT'S HIGHLY RECOMMENDED TO USE A RING EXPANDER TO INSTALL CAST IRON RINGS. THEY TEND TO BE A LITTLE FRAGILE WHEN INSTALLING. WHEN IT ACTUALLY FITS IN THE RING LAND. 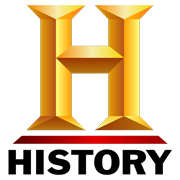 THE OLD STYLE IS THREESIXTEENTHS. THAT'S A 69 THOUSANDTHS DIFFERENCE. 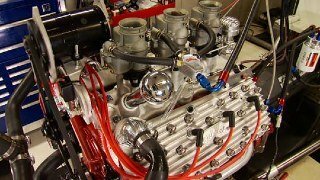 NOW MULTIPLY THAT BY EIGHT IN A VEIGHT ENGINE AND YOU'VE REDUCED A LOT OF SURFACE AREA AND A LOT OF RING DRAG ON THE CYLINDER, WHICH FREES UP HORSEPOWER. 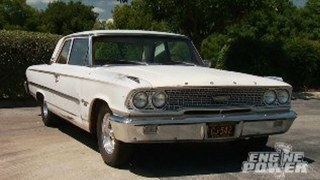 BUCKS A SET FOR A STOCK 350 CHEVY TO OVER $1,000 A SET FOR A FULL TILT RACE BULLET. (MIKE)>> THE NEXT TIME WE TALK ABOUT RINGS WE'LL GET INTO PROPER GAPPING USING BOTH MANUAL AND ELECTRIC GRINDERS. PLUS WHERE AND HOW TO SET THE GAPS PROPERLY SIZE WISE FOR ANY GIVEN APPLICATION.